I have been explaining this room box a lot lately to followers that have e-mailed me. I forget that not everyone has been doing miniatures for as long as I have. I don't get any of the miniatures magazines so I don't know what the DIY projects are and if this has been in there. I don't get any of the magazines on purpose, I don't want to copy, even unconsciously. I hope the directions aren't too tedious with all of the measurements. I have a diagram later in the tutorial to help out. This is the finished room box, it's about 6 inches deep, 10 inches from side to side and 8 inches tall. I know 8 inches is really a 8 foot ceiling height and that would be short for real life full size, but I think it works here. You can turn the box and have a 10 foot ceiling if you need the height. Boy, this is blurry! This is a collage frame I copied from the internet. When I bought my cheapie frame these were on sale. My husband pointed that out to me, too. 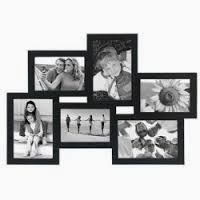 "Can't use that, I said I needed an 8" x 10" frame." While lying in bed that night I thought, "Darn, I could have used that." This would be good for themed room box settings, maybe something for a gift. This type of frame could also spot light some of your best miniatures. I saw this on the internet, too. 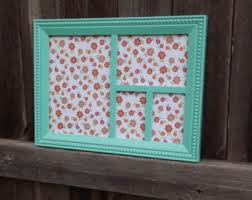 This frame would also be good for a themed gift or setting. For hanging on the wall I would probably not make these two examples as deep as the box I am making in the tutorial. Keep your pencil sharp and put a new blade in your craft knife. I have a piece of 20" x 30" foam core. This is the most common size available. I also have the $5.00 frame. Take the back out and if you can get it out take the glass out. I couldn't get mine out so I just left the glass alone. Measure inside the rabbet, I didn't misspell, that step down on the back of the frame is called a rabbet, it's for things to fit into, like glass. Measure both directions, it's probably about 8 1/16" x 10 1/16". I want you to find the center of the foam core. To do this for the 20" side measure in from each side and mark at 10". In the picture I've marked from one side and just marked the from the other side. See the space I have between the marks? That's how much short of 20" the board is. By eye or ruler mark the center of this space. Do this for the other end of the board. For the long side that is 30" measure from the side to 15" and mark as you did above. Measure from the other side and mark. If you have a little space between the marks divide it half as you did above. Turn the board around and measure and mark the other side just as you did before. Draw lines from center marks to center marks. I don't have a "T" square long enough for this task so I measure and mark. More lines to measure for. Measuring on the long side: have the long side facing you and measure from the middle line out to the side 4 13/16", mark; measure from the middle line out to the other side 4 13/16", mark. Do this for the other long side and draw lines connecting the marks. Turn the board around and measure the short side. Measure from the middle line out to the side 3 13/16"and mark; measure from the middle line out to the other side 3 13/16", mark. Turn the board around and measure just as you did above. Draw lines connecting the marks. I've got the short side of the board facing me. I have measured 3/16" away from the first line on the left and drawn a new line. Do you see that the new line is closer to the side, not the middle? I've measured 3/16" away from the other side's line and drew a new line. "X" out the old line, you won't cut on the old line. I've also made a squiggly line in the corner, this is waste and will be cut out. The new lines have all been drawn. Take care where they are. I've got the short side facing me, again. A long side is on my right. I am measuring from the first line to the edge. This should be around 6 3/16". I've now turned the board so that the long side is facing me. Got your measurement from above? Measure from the first line to the edge that measurement, I'm using 6 3/16", mark. I've drawn a line connecting the marks I made. There is a very light squiggly line on the right of the new line, that part is waste and will be cut off. My pencil lines are light and hard to see in the pictures. I recommend printing this out on a sheet of paper to guide you. This is what you should have, now. Cut the corners out. 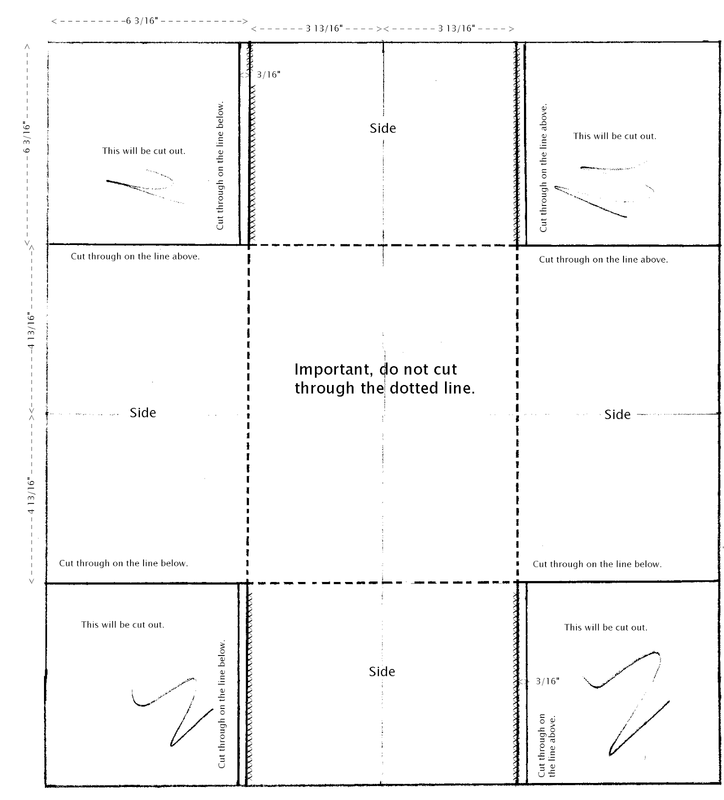 Do you see that I did not cut on the "X"ed lines? 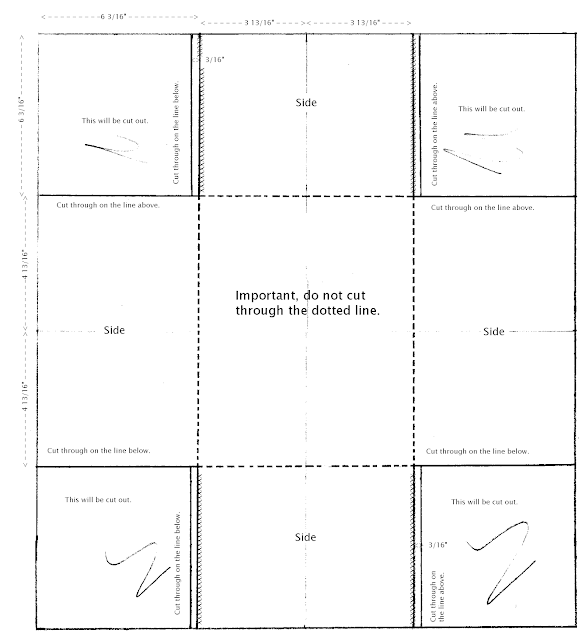 Cut on the dotted lines, don't cut through. Do you see how the sides will cover the top and bottom edges? As soon as I got the box folded, not glued yet, Digger, my cat got in. Now, that he's out let's put some glue on the edges. I've got glue on the edges. If I can keep Digger's tail out of the glue that will be good! I've got the box glued together. 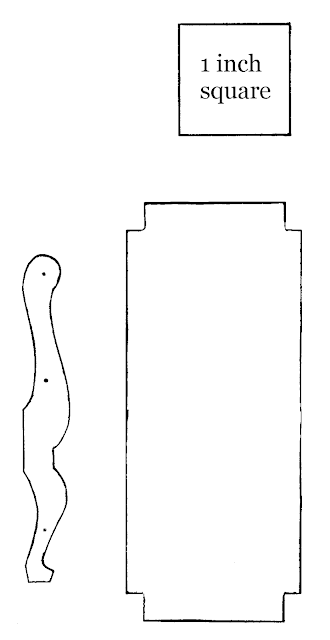 Showing the side and back of the box. I've got the frame on. Make some legs from stacked and glued foam core to match the height of the side of the frame. If I were hanging this on a wall I probably would not make it as deep as this. When I have finished decorating I will glue the glass to the frame and the box to the glass. I will use tacky glue. You can cover the box with scrap booking paper or wall paper, I have even covered the box with brown paper. Use something that coordinates with the inside decorating. The box I covered with brown paper is "Carl's Room", I think that's in the "Things to do, Things to see" list under Room Boxes. The box has an Asian theme. I found some stickers of post marksand post cards from Japan, origami, etc. in the scrap booking isle. I put them on the brown paper and used some Asian stampers for more decoration. I usually cut a piece of foam core for a faux wall for the corner. I will put a window in that wall. This is a picture of a very, very early room box I made for my youngest daughter, Sam. I have the window in the corner with flowers. I fixed a battery operated light in the window and the battery also operates the teddy bear lamp I made. This hangs on the wall and with a click of a switch it will light up. If I can find the materials would you like me to show you how I did the battery lighting? I hope you all have a MERRY CHRISTMAS AND A HAPPY NEW YEAR!!! Labels: How to build a quick room box with foam core and a purchased frame. I know I can copy and save there. I can't wait to get the Gallery going. I've been sent pictures over the past few years and thoroughly enjoyed seeing them. I don't know why it's taken so long for me to think about sharing them regularly with you. So, I want you to send your pictures of the tutorials you have finished. I will use your first name only unless I am told to keep it anonymous. You will be encouraging others to try the tutorials out. I am hoping this is going to be a fun thing to do and see. I know I have enjoyed the pictures, I think you will too. Please write me an e-mail at kkcompas@yahoo.com and we can talk.